Fifty years ago parishes across Ireland held special Sodality Sundays each month. In the parish of Abbey-Duniry one Sunday each month was allocated as Sodality Sunday for the men and women of the parish. On Sodality Sunday you were expected to make a special effort to receive the Sacrament of Reconciliation, also known as Confessions, to attend Mass and to receive Holy Communion. Each ‘Station Area’ in the parish was assigned a special area in the Church with its own banner and people were expected to take their seats in their own section on Sodality Sunday. In this parish, men always sat on one side of the Church and women on the other! There were Sodalities attached to the Churches in Abbey and in Duniry and young people in particular were encouraged to join their Sodality as a way of keeping them in close touch with the teachings of their Catholic religion and the reception of the Sacraments of Reconciliation and Eucharist. In the late 1960s the men from the parish of Abbey-Duniry were encouraged to attend a week-end enclosed Retreat to be held in the former Redemptorist Monastery of Cluain Mhuire in Galway city, now part of GMIT. This was organised by the Redemptorists priests who still have a Monastery in Esker. The Retreat started on a Friday afternoon and ended on the Sunday evening. Thirty men from the parish of Abbey-Duniry and forty men from the adjoining parish of Ballinakill attended one such Retreat in November 1968. We are delighted to have a photograph of the Abbey-Duniry group from that period kindly given to us by Mrs Teresa Hodgins whose husband John was one of the men who attended the Retreat in Cluain Mhuire. 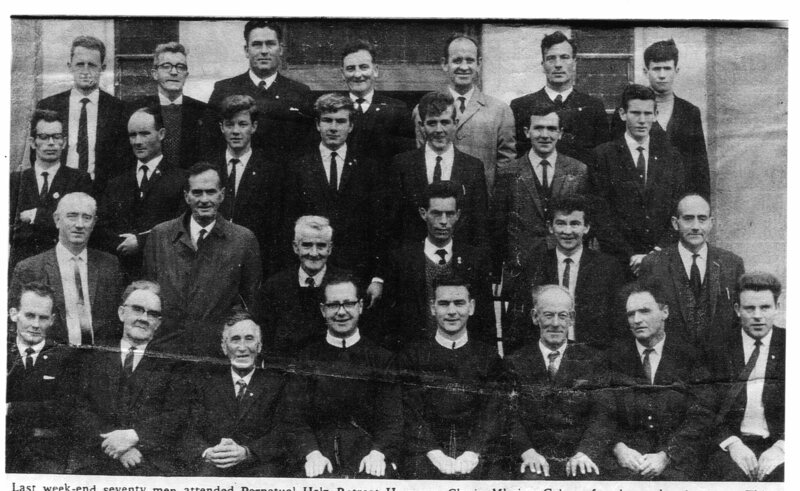 Group of men from the Parish of Abbey-Duniry who attended an enclosed week-end Retreat in Cluain Mhuire, Galway city circa November 1968. Back row L to R: Des Lynch, Mick Kelly, John Hodgins, Michéal Donohue, Gerard Dwyer, Amby Hodgins, Seán Kelly. Second row L to R: Martin Flood, Vincent McDonagh, Johnny Kelly, Tom Pierce, Larry Donnelly, John Holohan, Pat Roche. Third row L to R: Michael Lynch, Ned Finnegan, Edmund Hynes, Pakie Curley, John Donnelly, John Michael Larkin. Front row L to R: Naoise Larkin, Joe McDonagh, John Joe Broderick, Fr V Kavanagh CSsR, Fr E Hoey CSsR, John Madden, Michael Farrell and Val Kavanagh. Photo courtesy: Mrs Teresa Hodgins.